A fun and unique twist on the classic fishtail braid! You could use this technique to make a variety of different hairstyles. As shown in the photo above, all of the hair could be gathered into a large braid on the side or back of your head. 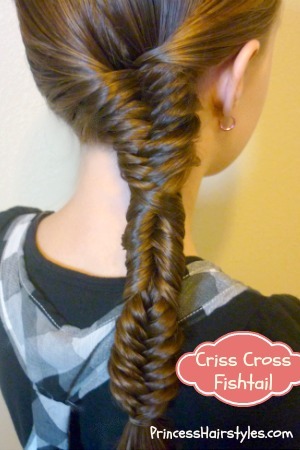 Or, you could make a smaller braid as shown in the photo below. Recently we used this braid to make a headband across the top of her head, which was super cute! I have included an example of this braid on the princess's mannequin practice head for you (below) because the details seem to show up better on blonde hair! ;) I love the alternating chevron pattern this plait creates. Also, we have had some subscribers tell us that they aren't being notified when we post a new video on YouTube. We try to upload a new tutorial every Wednesday, so keep an eye out for it to pop up on our channel some time Wednesday afternoon. Thanks! Wonderful and nice hairstyles.Looking so amazing and awesome .These are so nice and attractive . Where did you get your mannequin head? I've been wanting to get one to practice your hairstyles. That's the top hair style this year. 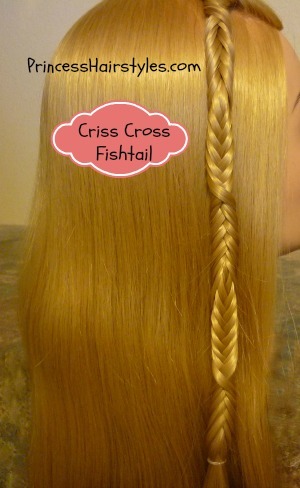 Fish tail was popular in many teenager today and look good also cute.